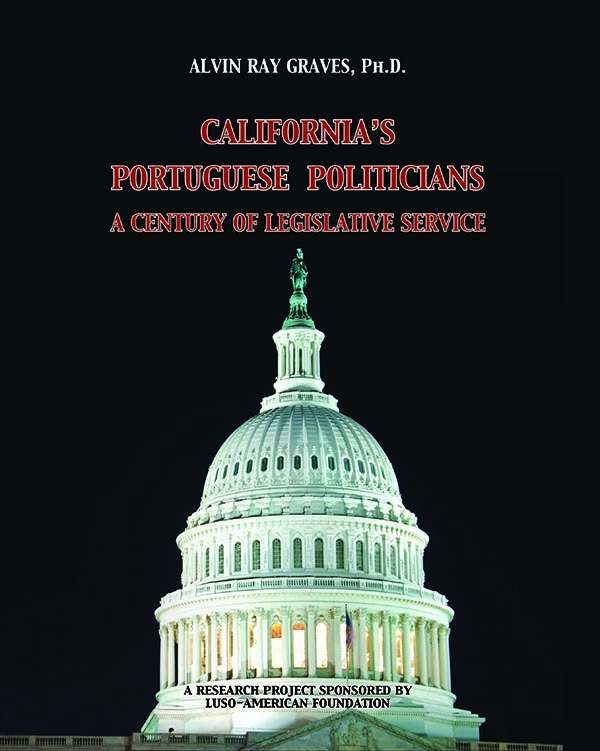 California’s Portuguese Politicians is designed as a 200 page hard-cover book printed in color on high quality paper, 8.5″ x 11″ format, luxury limited edition, profusely illustrated to capture the civic and legislative contribution of the Portuguese immigrant community of California to State and National legislations. From John G. Mattos, a first-generation immigrant from the island of Faial, elected to the California State Assembly in 1900, to David Valadão, a second generation Portuguese Californian elected to the US Congress in 2012, Portuguese-Californian immigrants have played a significant role in American politics in state and national legislatures. The author, Dr. Alvin Graves, thoughtfully introduces the reader to the pioneer Portuguese politicians from California’s San Joaquin Valley, by reflecting on their upbringing, their family lives, their civil service, their accomplishment and, for some, their pathway to Washington DC and the National Congress. To gain insight into the awareness and commitment of a community toward its civic responsibilities, one must understand the social force that binds the members of such community to specific courses of action. To understand a community in such a way is to understand its key motivators, its very social fabric. This book is but one step towards a broader discussion and understanding of Portuguese-American politics in California. Dr. Graves’ interest in the Portuguese in California is quite unique. When he first moved to Riverdale in 1962 as a junior in high school, he had never met a Portuguese person. Over the years, he talked frequently with the grandfather and uncles of his future wife about their life history and experiences. Following the publication by Portuguese Heritage Publications of Portuguese Californians – Immigrants in Agriculture (2004) Dr. Graves once again unveils another fascinating aspect of the Portuguese immigrant experience, in this well researched book about California’s Portuguese Politicians; their ancestry and their path to positions of legislative prominence. Dr. Graves and his wife Barbara have 5 children and 3 grandchildren. He has worked in investment advisory, university development and farm management fields, but has always maintained an intense personal interest in the Portuguese community in California.